One of the areas of science that has always fascinated me is complex fluids. These are liquids which have structures inside them, but the structures and order are so soft and fragile that the tiniest bit of force (actually stress) is enough to break them apart. Complex fluids will behave like liquids when they’re flowing, but if they rest for a while, the fragile structures reform. There are a number of molecular scale features that can make a fluid “complex”. Amphiphiles are molecules that are common in soapy fluids and in certain types of liquid crystals (lyotropic liquid crytsals). An amphiphilic molecule has two different chemical properties tethered together, sort of like a chemical “Jeckyll and Hyde”. One end of the amphphile really likes water, while theother would prefer to be in oil or even air. Their dual nature causes amphiphiles to gather together in little structures that place their different natures in like company – micelles and vescicles. Other fluids may contain polymers, long floppy molecules, that adjust their shape and properties during flow, or even nanoparticles that have been stabilized by surface chemistry. 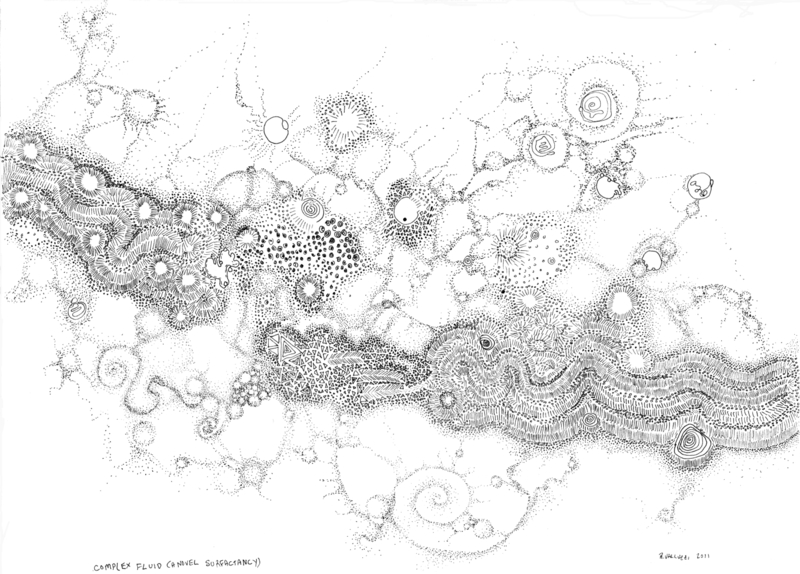 Complex Fluid, the ink drawing, is roughly 8×8 inches and was hand drawn with a very fine felt tip pen using archival pigmented ink and acid free paper. It depicts and alludes to the types of molecules and supramolecular structures found in Complex Fluids, and to the fragile order and organization they impose on the fluid state. More info on Complex Fluids here. Scroll down for external links.